Experience a taste of luxury, from Alperstein and the Yarliyil Art Centre. In the eastern Kimberly region of Western Australia, a group of artists work to preserve the rich culture of their lands, history and people across a range of mediums. 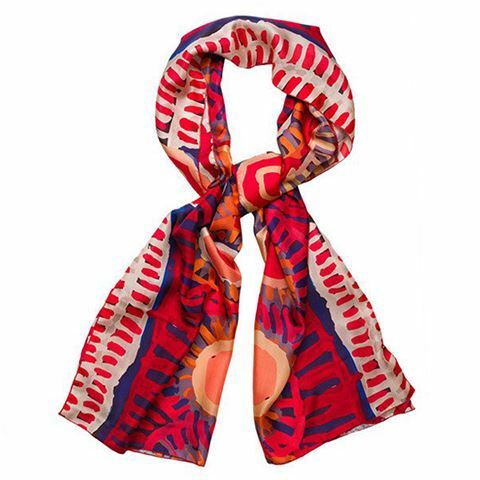 It is the work of this centre’s artists that Alperstein has chosen to display across a lavish collection of silk scarves. Made from 100% silk, these lovely scarves will compliment any outfit. Perfect for any art lover, they're a unique way to showcase and appreciate a stunning piece of art everyday. A beautiful scarf with a beautiful story? Yes please! Made in Australia from 100% silk. Based on Indigenous artwork from Murdie Morris.